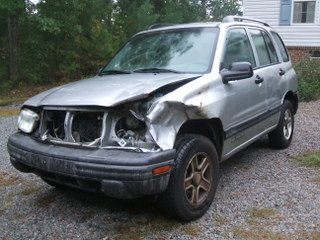 This picture of my old car after two deer ran into me is meant to grab your attention. Opening lines to a story must do the same thing. If the writer doesn’t have you locked in by the end of the first paragraph, you will be moving on to someone else’s story. Even I wonder what story follows this beginning. Alas, it is just a beginning meant to grab your attention. I may continue one day, who knows what comes from just a beginning. WRITING PROMPT: HE ENTERED THE ROOM LIKE HE. . . . In the middle of the cocktail party, where glasses were clinking and low murmurs of laughter rumbled through the room, he entered like he was on fire. A door banged shut somewhere behind him. Long strides carried him across the tiled floor, through the open French doors, and into the garden. There he found the apparent object of his fury. With hands clenched into fists hanging from his sides, he stopped, nose-to-nose with Alicia. His jaw muscles were taut, working. Words barely more than a whisper spat out. “What have you got to say to me?” The veins in his neck stood at attention. The redness of his face showed the pent-up anger ready to burst. “Darling, why are you so upset?” she answered his question softly with one of her own, cooing each word. The coolness buffered his heat. Her smooth face was the opposite of his contorted one. She glided back through the room crowded with people, glasses in hand, now silent, ears straining to hear. He followed her lead, rigid with anger. All eyes followed them.